Tim's work for Warner Bros through DC Comics has appeared all over the world in many different languages. He began work on the title in 1992. Tiny Toons Adventures was a TV animated Cartoon series and saw a plethora of merchandising all around the world. Tim's work appeared in the American comic books. His work also appeared in Newsstand Publications' Tiny Toon Adventures comic and in Bunny Band and Bunny Band Giocone published by Rizzoli Periodici in Italy to name but three countries to see his work in print there. Being licensed characters the pressure is always on with artists to 'keep on model', a phrase used to describe the job of keeping the likenesses of the characters like those used on the TV shows. Most companies provide a 'Bible' containing artwork samples of the characters in turnaround positions and also outtakes. Warners did not supply as many as some like 'Dreamstone', but provided more than when Tim worked on 'Power Rangers Zeo' and was drawing characters with no style guide sheet and the characters had not appeared on TV yet. The characters in Tiny Toons were baby versions of their adult counter parts, much like earlier concepts like 'Muppet Babies' and similar shows. Tim's work on the comics garnered him a reputation amongst certain publishers and enabled him to find further work across the ocean in the USA. The storylines were just like the TV show and the ones in their adult versions in the Looney Toons shows. They were madcap and manic, and Tim's layouts caused him a problem sometimes when he would add a perspective that would spark off other ideas in his editors heads, and changes would be made to accommodate these new ideas - changes with no extra money involved, even though the changes were only cosmetic and not down to bad drawing. Despite this fact Tim continued to draw for the title until his work began with Defiant and he chose a different path. The most memorable and successful of the stories he drew for Tiny Toons remains 'Scholarly Sweetie'. It was published in the American comic version of Tiny Toon Adventures in the mid-late nineties. 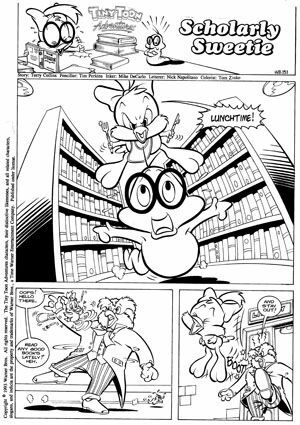 Also in Tiny Toon Adventures issue #3 entitled 'Scholarly Sweetie' published by Newsstand Publications in 1994. And also in Bunny Band Giocone entitled 'Imparta L'Arte' issues #5 published by Rizzoli Periodici April 1993.